Yesterday I had the first conversation with a new client under a new coaching agreement. He was referred to me by a previous client. That previous client was also referred to me, and at the time she was portrayed as someone who might be resistant to coaching. As we explored together and she became more open to seeing life differently, her life changed. Her relationships changed. And of course, her view of coaching has changed, to the extent she made the referral for the client I started with yesterday. That first call yesterday lasted only 35 minutes, and he already has his money’s worth from our time together. His shoulders dropped, he couldn’t help but smile in his OMG moment, and without doubt, his life and his relationships will benefit immensely from what he has already seen. I don’t coach around the clock. I coach around insight. One call with a client last week lasted 10 minutes. That’s not to say I don’t have 90 minute conversations, I certainly do and always schedule to allow for that, but when we’re done, when the client sees what they know they need to see, we’re done. And what fascinates me about these clients is how their experience of coaching has been nothing like they imagined. Indeed nothing like they feared. I connect with and offer to help many people. One part of this work that can look frustrating is knowing we can help someone and yet they stall on accepting any invitation to explore. This can only ever be because of fear. I rarely charge for an initial conversation and exploration, so there is nothing to lose for someone accepting such an invitation. Nothing to lose except, perhaps, their made-up vision of what coaching might be like, or indeed their own fear of change. My frustration around this is usually short-lived. I remember the beautiful changes people have experienced as a result of our time together, held testament by the number of referrals I’ve received. At a business networking event I was at last week, the host opened up the meeting talking about business being all about relationships. Perfect, I thought, because that is how I see life. All of life is about relationships, especially the one we have with ourself. What I see more than ever, when reflecting on our times together, is that whatever changes happen within my clients, it manifests in their relationships with others, with themselves, and with life. I don’t know anyone who doesn’t have at least one relationship in their life they’d like to be different, including me! The beauty and privilege of this work is that I get to witness that happening with everyone who works with me. Sometimes little shifts that bring an ease and flow in a work environment, sometimes a miraculous restoration of personal loving intimacy. I’m privileged to witness it all. Of course, I’m not here to help everyone. Not everyone is willing to take action beyond their fears, to experiment and come onto a call with undefended openness, to explore how life might be a little more wonderful for them. If you’re reading this and at some point I’ve offered to explore something with you and you’ve not taken me up on that, I’m genuinely curious why that is. What are you believing about coaching, or perhaps about me, that prevents you accepting such an offer to explore? I’d love to hear from you, by private message, if you’re willing to share. And if you have something in your life you’d love to be different, something you’d love to change or create, despite any fears around that, whatever you might be imagining about how possible such changes may be or what they might require, are you willing to simply talk and explore? 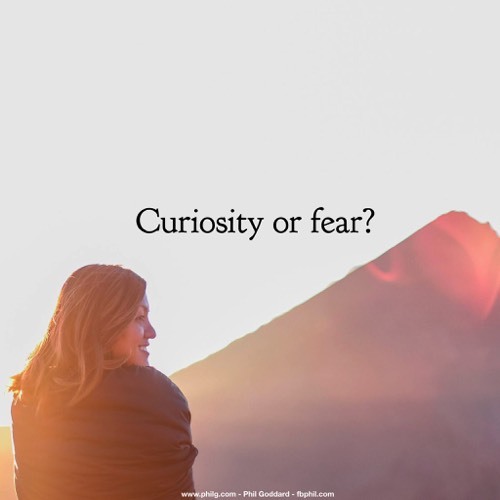 Are you willing to choose curiosity over fear? I’d love to hear from you too. Anything really is possible, and is usually much easier than we dared imagine.